Aiming to bring blockchain to Curaçao – CX Pay B.V. Recently, there was an announcement by the Curaçao International Financial Services Association (CIFA) in consultation with the government ministries of Economic Development and of Finance, regarding a Curaçao Blockchain and cryptocurrency Taskforce that was established. The taskforce is represented by entities that are active in Curaçao’s international financial sector such as cryptocurrency specialists, lawyers, auditors, and representatives of the Dutch Caribbean Securities Exchange (DCSX). Both the Curaçao government and CIFA agree that the current developments in the crypto space can significantly create new economic opportunities for the country. One of the first steps towards achieving this goal is to create relevant legislation and clarity when it comes to regulations. Curaçao can become an attractive jurisdiction for blockchain startups, payment processors, service providers, and exchanges. CX Pay is based in Curaçao and is a payments solutions company committed to empowering businesses with tools to succeed in the world of ePayments. Their focus is on payment solutions and innovation through ePayments, geared towards simplifying collection of funds for business owners through different payment methods. CX Pay offers solutions for retail storefronts, payment processing for both online and mobile devices, electronic invoicing, digital wallets as well as digital vouchers. These payment options are not only possible with credit cards and (140+) alternate payment methods, but also with 15 different Cryptocurrencies. As part of the roadmap to a complete omni-channel, where companies, groups or entire islands in the Pan Caribbean market space will be able to thrive through a digital ecosystem, CX Pay will be able to integrate with local banks, making epayments possible with a bank account. CX Pay has played an important role in bringing e-commerce to the (Dutch) Caribbean since the beginning of 2016. Some of their most notable partners include the MCB Group, CIBC FirstCaribbean, Scotiabank, Vidanova Bank, PPRO, First Data and EVERTEC, as well as Mastercard for the Pan Caribbean market. Chainzilla and CX Pay recently met and discussed the possibilities of utilizing ChainZilla’s expertise to offer enterprise blockchain solutions for companies in Curaçao. This includes blockchain creation, ICO management, and app development. ChainZilla is a company that streamlines blockchain development and deployment. It allows companies and individuals to launch blockchains, decentralized applications, and initial coin offerings with minimal effort. Their goal is to become the standard for bespoke blockchain as a service. ChainZilla offers blockchain solutions for Komodo, Nem, Qtum, and Ethereum. Services include white label wallets, DEX integration, ICOs, and custom blockchains creation. Curaçao has a strategic significance in the growth and expansion of cryptocurrencies and blockchain tech — with crypto trade volumes increasing in Latin America and the Caribbean, expanding to this region will be crucial for the adoption of cryptocurrency in the region and important for our growth as a blockchain service provider. 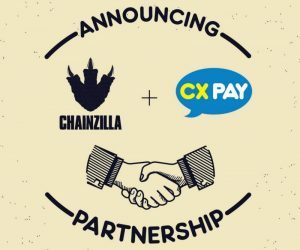 ChainZilla has partnered with CX Pay to combine resources so that we may play a role in streamlining blockchain solutions in the entire region. Interested in launching your own blockchain?